“After Tiller” has opened at the West End Cinema in Washington, and Sunday afternoon at 5 PM there was a special benefit held by DCAF, the DC Abortion Fund, link here. The documentary, directed by Martha Shane and Lana Wilson, traces the work of several late-term abortion providers after the murder of Dr. George Tiller in Kansas in 2009. One of the physicians, Dr. LeRoy Carhart, was present for the Q-A. It isn’t hard to find some rather strong criticisms (to put it mildly) of his practice on the web with just a casual search. The documentary focuses in some part on a clinic in Bellevue, NB, which faces closure under a new state law banning abortions after 20 weeks. Providers go to certain states, including New Mexico, Colorado, and more recently Maryland. The documentary makes a strong point about how the “pro-life” movement, often perceived as part of the “religious right”, has gotten much more influence in local and state governments than at the federal level, and has been able to shut down late term abortions in most of the middle and southern parts of the country. Activists say that progressive voters have become nonchalant in their interest in participating in local and state election racers (particularly in being interesting in running for office at all). Many states have laws requiring providers to have admitting privileges in hospitals, which means that they must become regular physicians with practices capable of attracting “legitimate” patients to the hospitals and must live close enough to serve on-call. That would be like requiring me, as a self-publisher, to sell (not give away) a minimum number of books to be online at all. The documentary also covers the “bullying” aspect of the problem, starting with the obvious threats and pickets. Many landlords are afraid to rent to providers, so there is a practical effect. However, in Maryland (between Frederick and Washington near I270) the landlord stood by the provider despite protests. Pro-life activists actually demonstrated at the middle school where the daughter of the landlord went to school. The official site is here. The film, form Oscilloscope, showed at Sundance and AFI Docs. My own take on the “right to life” issue is that abortion becomes a proxy for a much bigger issue, which has to do with prolonging life at the end when there is severe disability. As a gay man unlikely to cause a pregnancy, abortion does not affect me directly, although I can imagine the arguments that ensue if there is ever a genetic or congenital test for future homosexuality or transgender situation. But any of us can be responsible for a disabled family member or parent. The providers insist that women really need the service, and that the medical needs in late term situations can be legitimate. 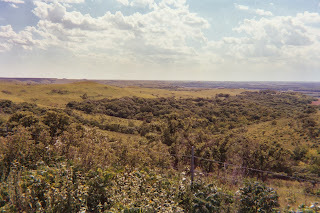 First picture: Flint Hills in Kansas, my visit, 2006.